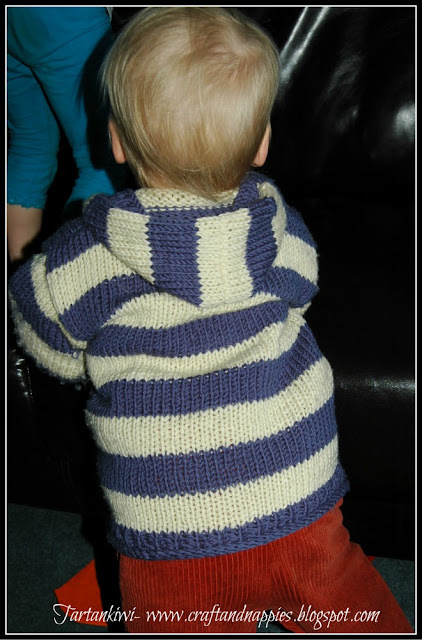 Remember that I showed you some knitting that I was doing for Scallywag? Well, I can now proudly reveal the finished hoodie. It is knitted using scrummy merino wool and the Weekend Hoodie free pattern from Lion Brand Yarn. I am kicking myself that I didn't think to check the feedback on this pattern on Ravelry until I had finished the hood. Several people commented that the hood pulls on the shoulders when it is up. At the moment the fit is fine, but as Scallywag grows I can see this becoming a problem. I just wish that I'd made the hood a little bit longer! I will admit that I am a lazy knitter who doesn't do test swatches to check tension and gauge. 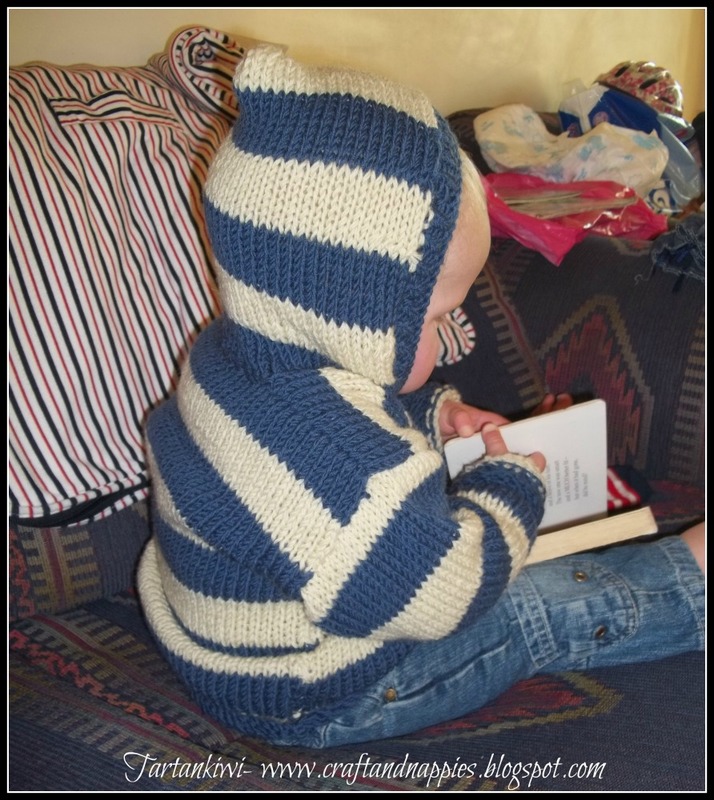 I made a series of calculated guesses when working out what size to knit (I aimed for large thinking that if it was too large for Scallywag it would fit Rascal!) I'm stoked to report that my risk paid off, the hoodie fits Scallywag with lots of (but not too much) room for growth. 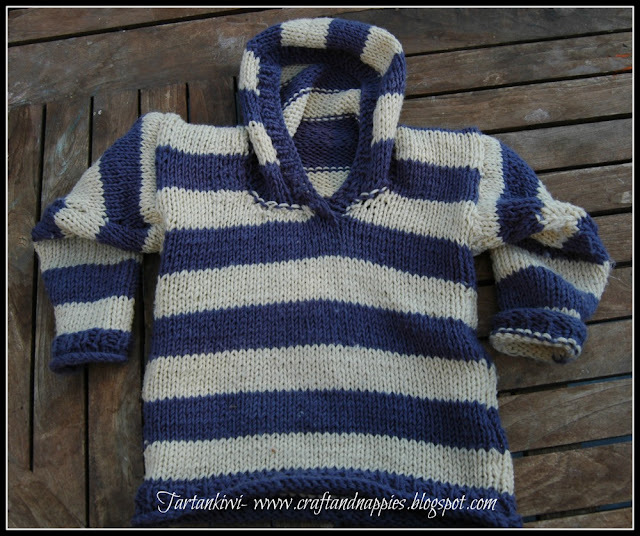 I love the way that the stripes worked out, but the next time that I am tempted to knit stripes with double thickness yarn PLEASE talk me out of it... At one point I had eight balls of wool on the go and making sure that they didn't get too tangled was a nightmare!!! My knitting is definitely getting better, but I want to work on my technique for picking stitches as the join between the hood could be neater. Apart from that I'm really pleased with the results. I finished the hoodie off in the car on the way to Wanaka and I'm proud to say that Scallywag lived in it virtually all holiday. He was so snuggly and warm and looked even cuter than usual! I love it! Would I use this pattern again?- Yes, but as I said I would make the hood bigger. I'm joining with creative spaces and Creative Friday. 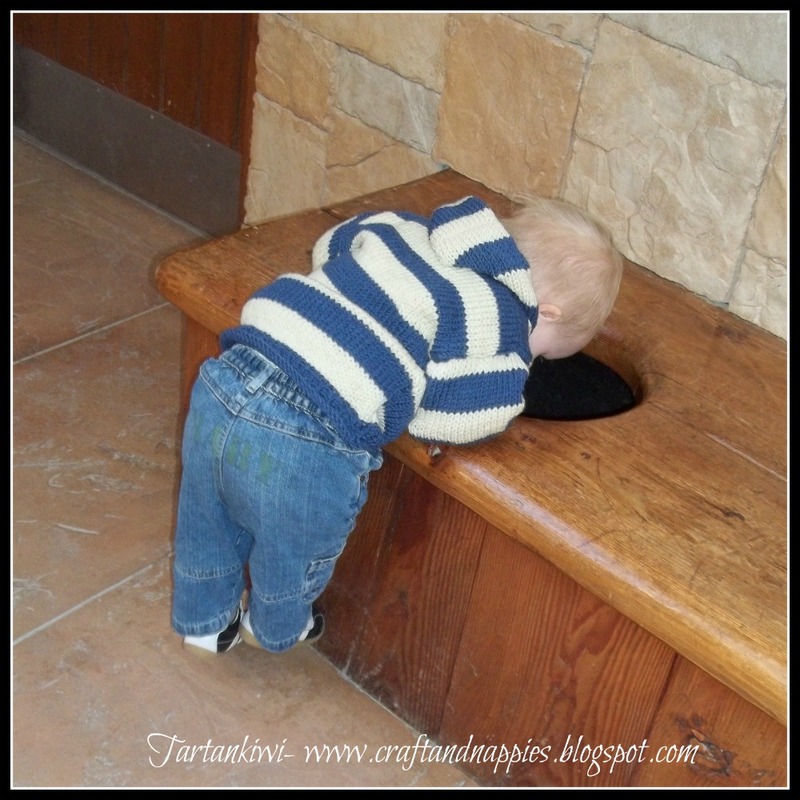 Couldn't resist including this photo of Scallywag at the Puzzling World Roman Toilets! Awww! that is lovely! He looks adorable in it too... I love stripes but feel your pain I was knitting something stranded not so long ago and boy the nightmare of tangled yarns! First you had me at the nautical stripes, then scallwag is a adorable, cute little bundle. Then you had to go and mention Wanaka, although i have never been it seems everybody else has and rave about it. X.
WOW! How cute is he and how freaking adorable is that hoodie?????!!! You blow my my Juliet! I love it! It is gorgeous! Love the stripes and the blue and white look great. So clever!! Beautiful! I'm so impressed at your knitting skills! and clearly your family is too! It looks so lovely and warm! Well done. I love the stripes! Looks super warm and cuddly! Well done Juliet! Hoodies and boys just go together so nicely. Your little guy looks lovely and warm in his. Oh that last photo made me giggle. Too cute! Do you make them in grown-up sizes too?! They are too cute and snuggly! Wow! Wow. Wow (very impressed) Not often I see hand knitted stuff that I think looks good. There's a lot of ugly knitting out there (too honest???) But this is super cute! Well done! That is so gorgeous! Go you! Is there anything you cant do? 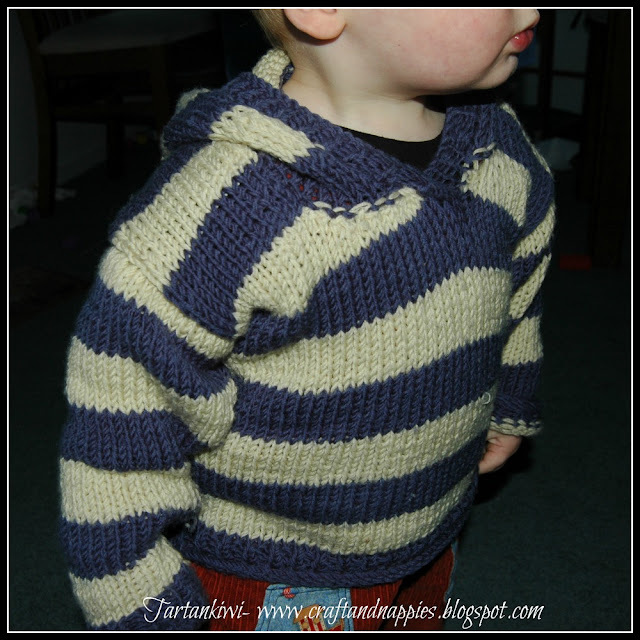 What a great looking hoodie and super cute on your little cutie! Oh my goodness that is adorable!! You did a great job on the hoodie! You did a great job! That hoodie is wonderful! I probably wouldn't have given that pattern a second look, given only the Lion picture of it. But I am totally sold by yours. He looks so great in it, and the lines are nice - when you can see them. Thank you for showing me!